Primate Elijah Babatunde Ayodele is a year older today, Sunday, February 14, 2016. He started heading church at the age of 16 and has made tremendous successes in the last 39 years in that he now has churches in Nigeria, Europe and the United States. Ayodele, who prefers to be best called “servant of the most high God” as against primate, bishop or a general overseer, did not start off as white garment church man as he was born into the Christ Apostolic Church (CAC), Idi-Oro, Mushin, Lagos where his father was a front runner and which the Junior Ayodele attended until 1972. He had his primary and secondary education in LCC and MTC, both in Mushin, during the days of morning and afternoon school system in Lagos. He then moved to Annunciation Grammar School, Ikere-Ekiti and, from there, to the Nigerian College of Aviation, Zaria, after which he joined the then Okada Airlines owned by Chief Gabriel Igbinedion. 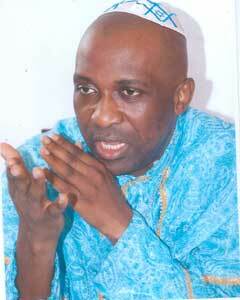 Ayodele had been an SU, Deeper Life, gospel church man and had served as reverend father in Catholic Church. He had also been to other churches like Methodist, Anglican, Celestial, Cherubim and Seraphim. A church administrator, church manager, counsellor, evangelist, apostle and a prophet, the founder of Inri Evangelical and Spiritual Church Wolrdwide has no less than 250,000 who have benefited from his micro-credit initiative scheme for widows and has empowered over one thousand youths while assisting his church members to own properties. An instance is where he bought a car of about a million naira and sold it to a member for N20,000. Since over 39 years that you have been in the Lord’s vineyard, what have been your major challenges and consolations? I don’t believe in challenges. Everything I have seen on earth since my days in the Lord’s vineyard is just experience, not any challenge. Working for God has given me a wide experience to understand what life is all about and to take life easy. And from my experiences, I teach a lot of people. I must confess to you that if I did not work in the Lord’s vineyard I might have died. My plan was to be a military man, a lawyer or a journalist. Honestly, I must say that it is a privilege and honour that God called me to work in His vineyard and I so much appreciate God that, if I would ever come again, I want to work as a prophet of God. And, on the strength of God, I want to serve people. I don’t want people to serve me or take me the way people take pastors. How do people take pastors which you don’t want and how should a pastor carry himself? A pastor must be humble. Yes, because you are anointed of God people want to respect you and they want to do anything to honour you. I don’t feel comfortable to see people kneeling down for me. I am not God; so that they don’t need to worship me. This is just a gift from God that any other person can have. Yes, people kneel down in admiration of you but they are only respecting the anointing in you. I appreciate my church members and I am more comfortable relating with them at their own level. I can even hold you in the hand so that you feel free and happy. It is not only when you kneel down that you respect me. You may be a traitor and still kneel down for me. I want a respect that is transparent and sincere. I wasn’t born as primate. It was in the Lord’s vineyard that they started calling me primate. Some people call me doctor; in fact different titles, bishop and so on. My own is to humble myself before God and I am human. Just call me the Servant of God. You can even call me Brother Ayodele, I don’t mind because it has no value to me. So, I don’t want to believe in challenges as problems. They only end up giving you strength and courage in order to forge ahead. The work of God has made me to have a lot of experiences and I thank Him for having made me to be one of the servants that work for Him. Could you share with us some of your experiences in life, even outside the Lord’s vineyard? At the age of 10, I started doing hard labour but hard labour, is not punishment but for you to grow strong. Like at that age, I would wake up very early, about five o’clock in the morning, during harmattan and start going to farm. Today you call that punishment. And that is why I owe a very huge service to my step mother because I was trained and brought up by my father and step mother. My step mother did so well in my upbringing. What happened to your mother? My mother died when I was age 10 and my step mother took over from there and taught me every good thing that growing up child needed to know about life. It is very rare to have such a step mother. She taught me to be strong,which some people saw as punishment but it was not. My step mother was a woman like man, very courageous. She is still alive. Now that you are celebrating your birthday? I don’t believe in birthday celebration. Birthday is a day for reflection and appreciating God and I say, ‘God, I thank you for making me what I am today. It is a day you sit down to thank God, your parents, those who have added value to your life and even those who have not added value to your life. How about your prophecies, considering your birthday in retrospect? I didn’t know that I would be a man of God. I started making prophecies at the age of 16, precisely to the nations and God started blessing me at age 18. I don’t know the magnitude of what God has done for me but I am just thanking Him and appreciating my wife, my children, my church, my friends and my friends in the media. Prophecy is what God uses you for and not you using yourself for. So, when my prophecies that are negative which I have warned against come to pass, I am not always happy. For instance, there was a train accident in Germany and there was a boat tragedy, both of which we spoke about on November 23. They don’t make me happy. Devaluation of Naira, we said it much earlier and, states breaking down economically, we said it ahead of time. And we said people should seek the face of God to avert the misfortunes. See the case of Rivers and Akwa Ibom states. When they sought the face of God, see how it went with them. Like Sunday Oliseh is now having problem with NFF whereas, in the beginning, we said he would have challenges that might frustrate his efforts. He didn’t take it serious. Taking the Super Eagles to AFCON, this may not be the best time for the team. Oliseh will have to seek the face of God, otherwise, he will be dismissed from the Super Eagles. When we said pray so we don’t lose anybody in the NFF, it didn’t mean a message of doom. What do we do should be the next thing. You can call your pastor or your Imam that is the warning that has been sent to me, please come and pray for us. What matters most is that you must seek the face of God. See the recent helicopter crash in Lagos, we said it that we should pray and we thank God it didn’t claim lives. When a prophet warns people, let them take heed. Warning is not to create panic, to alert you danger so as to avert it. In my first interview with you, you said Nigerian leaders were failing because they moved away from God. Is that still the situation now? They are still facing that challenge now. Buhari should seek the face the of God for him to run his government successfully because there are challenges ahead for him and his second term will be faced with a lot of challenges. That is why I have to warn (Abubakar) Atiku that he must take precautions and seek the face of God before he takes any (political) step, otherwise, he will be rubbished. Also, Tambuwal and el-Rufai should seek the face of God before doing anything pertaining to 2019. There are a lot of things that will happen ahead of 2019 but national unity must not be taken for granted. The unity of Nigeria is paramount at this time because issues will come up. Our leaders fail to listen because they are deceived by many pastors. I smile when some people (pastors) talk about an issue which happens when there are already signs that that issue would come up. Go and check our records, past and present, we give warnings two, three, four years ahead. Some people want to trouble Buhari’s government and he has to be steadfast on the issue of the economy. There is going to be more retrenchment this year and so, Buhari needs to take a very bold step and, again, he needs divine intervention to get things right. APC needs to seek divine intervention and take caution because elements that will crack the party have infiltrated it. Journalists too need prayers. I told you about the Nollywood artistes which is what is happening now. Senators need prayers and the Senate President must not ignore my warnings. He needs to seek the face of God because enemies are running after his bright ambition. People who look out for your warnings, what message do you have for them this year? Generally, we need prayers for President Muhammadu Buhari because he has genuine mission. Jonathan also had genuine mission but he didn’t prepare for presidency. But he had done what no Nigerian leader had ever done before. For an incumbent President to leave power just like that? It has not happened before in Nigeria. Even when he knew that he was defeated by popular votes? Yeah. But he could have turned things around. He had the pencil and the eraser. Nobody could question him. Do you agree that God used Jonathan to save Nigeria? Yes. Nigeria was at the verge of disintegration and you know all the things that had been said about Nigeria breaking. It was not saved by soothsayers or anybody. No. It is God that used him to save Nigeria and so, we should be grateful to Jonathan for being able to avert crisis that could put Nigeria asunder. It is difficult to see somebody like that, a Nigerian who would vacate the seat peacefully the way he did. I am not here to judge anybody. But nobody is a saint. It was God that masterminded all that Jonathan did during the election that led to the peaceful transition. Holy spirit moved Jonathan to surrender because, if he said he would not surrender, Nigeria would not be the same today as we would be in crisis. So, we must salute his courage. So, Buhari also must learn from his own past experiences, losing elections three times and, at 73, God now made him President. For Nigerians, their role is to be prayerful.